Well, things are getting a tad-bit crazy here in Conway, Arkansas. Just trying to get a Kris Allen t-shirt here in town is an ordeal. I personally spent an hour after work yesterday, at HipSway, waiting on a t-shirt - only to leave empty-handed. I was told to come back this morning at 9am to pick up my shirts. 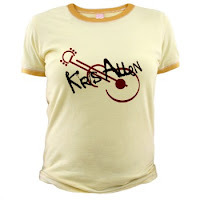 After leaving HipSway yesterday, I headed to Ace Hardware (the place selling the official Kris Allen t-shirts) to see if I could get a look at the t-shirt design. I was initially told that they would have a shipment of t-shirts delivered at 6pm but the delivery was put off until 8am today. I liked the looks of the official design so I decided to come back this morning and buy one. Imagine my surprise when I arrived at 8:05am and their huge parking lot was full! There were two LONG lines: one to get your ticket(s) - limit 6 - and the other to get your shirt(s). Well, an hour later, I got my shirt and two more for my coworkers. When I got to work at Acxiom this morning, my coworker told me that her son (who works at UCA - Kris Allen's alma mater) told her that people were in line, early this morning, to get tickets for the 3pm concert at Reynolds Hall. By 11:00am, the line had wrapped around the building. They started issuing tickets at noon today. Doors opened at 2:15pm today. We also heard that people spent the night at Simon Park, downtown, to save their seats for the 5:30pm concert later today. Kris performed at the Little Rock Riverfest Ampitheatre today at 11:30am. The crowd was estimated to be around 15,000. I-40 was locked up this morning from Conway to Little Rock as the fans traveled to see Kris perform at the Ampitheatre this morning. Kris Allen likes Holly's Country Cooking! My husband, Paul, picked me up for lunch and took me to Holly's. While paying for our food, Paul joked with Holly, the owner. When she asked if that's all we wanted he said, "Yeah, and we also need a plate for Kris Allen." She said, "Okay" and I told her he's just kidding. Holly said she actually has a huge order for him later on today. I told Paul I wouldn't be surprised if the American Idol crew asked Kris where they could get some good home-cooking and Kris said, "Holly's!" 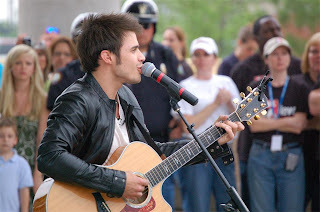 Kris Allen likes Stoby's Too! Paul called me a little bit ago to report that as he drove by Stoby's (which is 3 blocks from our house), he saw it was packed out and there were police cars and a black stretch limo out front. I told him that I'm sure Chris is inside. Stoby's is another Conway local favorite, offering burgers, fries, their famous original cheese dip, and other American cuisine. I personally like Stoby's for their crushed ice or as I like say, "the good ice!" Stoby's has a big banner on the roof that says, "Stoby's supports Kris Allen with a lifetime supply of cheese dip." Funny, huh? Paul estimated there were about a hundred or so people outside of Stoby's waiting (cameras at the ready) for Kris to come out. Paul said when he told our 16-year-old son that Kris ate lunch at Stoby's... Dylan said, "I don't see why he would want to eat there, when he could've eaten at Holly's." Hehehehe! It's just been announced that the song the judges picked for Kris to perform Tuesday night is "Apologize" by One Republic. I think it's a good choice. I plan on going downtown after work for the parade and concert. It's going to be fun to see how far away I'm going to have to park and also fun to see how close I can actually get to the action. 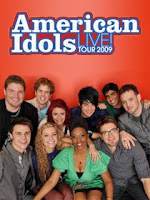 I called into Alice 107.7 yesterday trying to win tickets to the American Idol tour at the Alltel Arena on July 25th. I was actually the winning caller but I answered the trivia answer incorrectly. Dern. 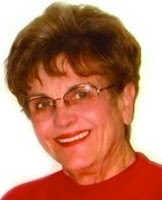 The question was, "When Kris Allen was in the Top 13, what song did he sing?" I guessed 'Man in the Mirror'. Survey says.... EEEEEEEEEHHHHHH! The right answer was "Remember the Time". I choked. I would've Googled for the answer but I was in shock that I was caller #10. CHOKE! Traffic here is starting to get crazy. And school has not even let out yet. Everyone has Kris Allen fever! Paul - It was definitely a crazy day!